Heads may need to roll at ABC News, specifically the “investigative division” if they are even remotely serious about this headline. First off, they’re citing People magazine in their sub-headline. Secondly, the answer to their question is quite clearly, “Drugs”, or more likely “Massive Amounts of Drugs”. Is ABC News headquartered in a cave? Who wrote the article, Britney’s mom? 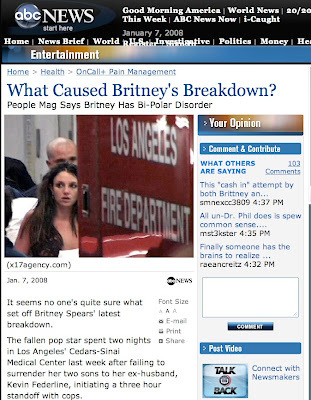 The first line is “It seems no one’s quite sure what set off Britney Spears’ latest breakdown.” Really? Who’s not sure? Who isn’t absolutely positive that it wasn’t “Drugs” or “Massive Amounts of Drugs”? The girl is rumored to be drinking “Nyquil, Vodka and Red Bull”. NYQUIL! That makes no sense- who drinks Nyquil in a drink with Vodka and Red Bull? If you can afford Vodka and Red Bull, you can afford something other than Nyquil to drink it with! You only drink Nyquil to get drunk when your underage and can’t get booze, or your so broke, you raid someone’s medicine cabinet. Britney is a millionaire- she’s choosing to drink NyQuil? No wonder they called Dr. Phil. She’s completely out of her mind and has terrible taste in drinks. I don’t care if she “tested clean”, that just means she doesn’t leave her house without a vile of someone else’s pee. Please copy and paste the bottom of this entry into an email and send it to ABC News, cause people don’t beat cars with umbrella’s and shave their heads in the middle of the night without drugs. "She’s completely out of her mind and has terrible taste in drinks." Indeed she does. She's been known to drink champarne with coca cola! Quoting People magazine? Quite the news division they have there! "Lets ask Doris the receptionist what information she has on Britney..."
"Well, I read in People Magazine that Britney may be bipolar." "Stop the presses! Front page news!"